As some of you may know, I at times find some of the most boring sounding things incredibly interesting. Take for example, Between the Folds which is a documentary about origami that I really enjoyed. Sounds exciting right? I'm sure you can imagine how excited I am for Watching Paint Dry: The Series to start streaming on Netflix. From the moment I read the description of The Story of 1, I figured I'd be in for a nice boring good time. 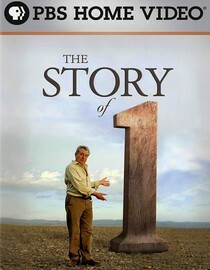 The Story of 1 is a documentary about the history of the number 1 and features Terry Jones of Monty Python fame. Naturally I thought this show would be right up my alley. Unfortunately, I didn't really enjoy it much. It was somewhat informative, but I think they tried a little too hard to make it funny and they just missed the mark. The crappy CG didn't help either. I would have rather watched a very dry history of the number 1 that was more informative than something like this that comes off as "cutesy". It's not awful, and if you're really curious about the number 1 then by all means, check it out. If, like me, you're just looking for something boring to watch and maybe teach you a little then there is better PBS programming out there than this for you to watch. Why is it in your queue? I like watching things that sound boring. What stood out the most to you? The weird CG 1's running around everywhere. What mood should I be in to watch this movie? In a high school class room when your teacher has a hangover and is too out of it to teach.